'When you have an incident like this, everybody involved has a certain level of sadness ... ,' said Richmond police Chief Scott MacMaster. Two teenage boys have been charged with arson in connection with a fire that destroyed a portable outhouse Sunday evening in Richmond. The fire was reported around 7:45 p.m. in the outhouse at Houdlette Field, a town-owned recreation area on High Street. Firefighters knocked down the blaze, but the unit was destroyed, Richmond police Chief Scott MacMaster said. Investigators from the Police Department and the state fire marshal’s office were able to find physical evidence that linked the teens to the fire, according to MacMaster. Among the evidence was video recorded at the Marcia Buker School, which is next to the field. Police also interviewed some witnesses, MacMaster said. The boys, who are ages 13 and 14, are both from Richmond. They have been charged with arson, a class A felony. One was summonsed. The other was arrested and released to his mother, according to MacMaster. The handicapped-accessible bathroom had a value of about $1,200, MacMaster said. The town won’t replace it this year because it was already due to be removed at the end of October. The fire occurred about two hours after another one was reported on railroad tracks near Fuller Street. Police were able to find evidence that linked the boys to that fire as well, MacMaster said. Police now are investigating whether there also is a connection with the outhouse fire and vandalism of the restrooms at Richmond’s waterfront park earlier in the fall. 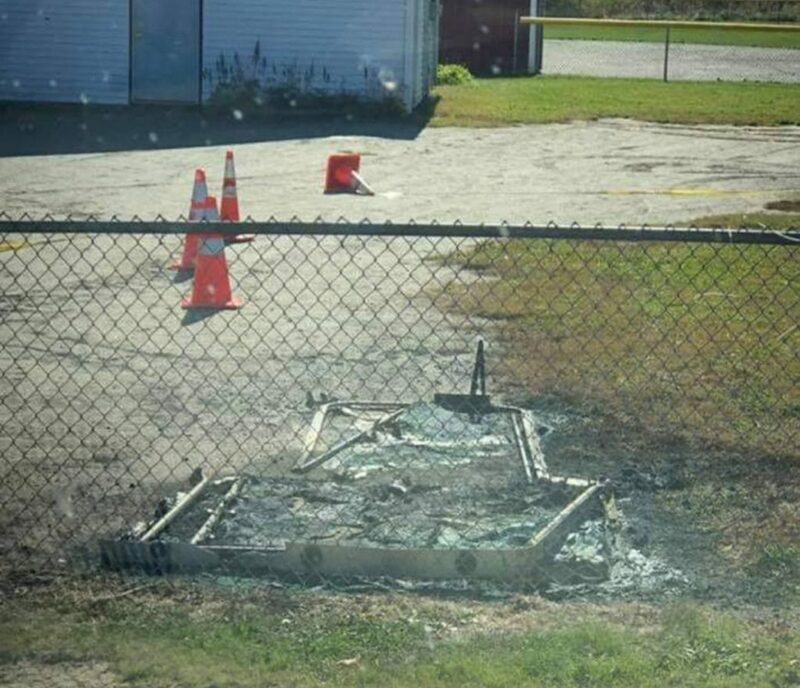 That caused about $500 to $700 worth of damage to the facility. As a result, it recently was closed to the public. After the outhouse was destroyed Sunday, a couple of local businesses raised more than $100 to be awarded to anyone who provides information about the suspects, according to a Facebook post from Quality Landscaping LLC. Before that money can be awarded, MacMaster said, police now must go through the tips they received to see if any helped advance the case.